Joey and I actually bought the ingredients for one recipe that was a unique version of tuna salad. We cut radishes, onions, cheese, and tomatoes. (It also called for olives which we left off because we don’t like them and green beans and capers that we omitted because we didn’t have them.) Then we boiled some eggs and some potatoes and opened the tuna. Each item is scooped onto the platter in its own area. Then we made a dressing of olive oil, wine vinegar, garlic, onions and mustard – oh, it was good! You just scoop the items you like into your bowl, mix them up and drizzle on the dressing. It was almost like a homemade salad bar. We LOVED it and my candy, coke, chip and cookie eating husband even took the leftovers to lunch the next day and came home bragging about how good it was again! 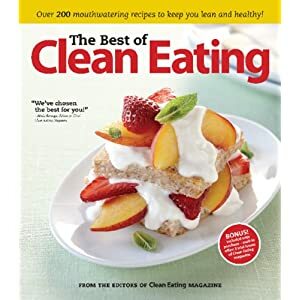 I would definitely recommend this cooking book to anyone looking for an appetizing way to eat healthier and “cleaner”! Next on my list of things to try is the Apple Cheddar Grilled Cheese Sandwich . . . oh . . . Looking to get your degree? Discover a great degree at onlineaccountingdegree.org.